Multiple protocols are offered with this COM Express module. Enhanced features regarding the Gigabit Ethernet, eSDHC, and eLBC mean that Dynatem’s board provides fast and reliable data transfer between memory, I/O, and networking devices. ECC-capable memory further ensures reliability and accuracy. With these specifications the CPU-161-28 is truly a robust module and is backed by Eurotech’s focus on quality manufacturing and production. OEMs can choose from a Linux or VxWorks operating system. Custom development environments can be supported as necessary. Dynatem offers a standard carrier board and offers services for those customers who wish to design their own. P1021 Processor – The CPU-161-28 supports the P1021 processor which comes with two 800MHz cores. ECC Memory – The CPU-161-28 comes with DDR-3 memory which supports Error Code Correction (ECC) and increases reliability and accuracy in data receiving and transmitting. Compact COM Express Form Factor – At 95 x 95 mm, the CPU-161-28 is ideal for small form factor designs which need the flexibility and performance possibilities of the COM Express form factor. 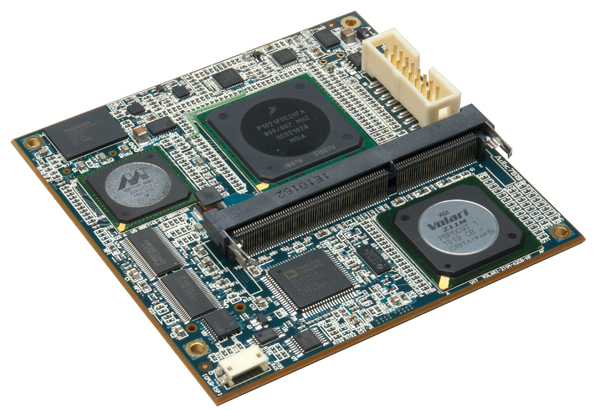 Video and Graphics – LVDS and VGA are supported on the CPU-161-28 for applications requiring graphics and video.